MRS BROWN’S BOYS was beaten to the top Christmas telly ratings spot by the Queen by a slim margin. Brendan O’Carroll and co pulled in 7.61 million viewers when Mammy’s Tickled Pink was broadcast on BBC One just after 10pm. The Queen traditional Christmas message managed 7.81 million views across BBC One and ITV at 3pm. Eastenders came in third with 7.5 million. 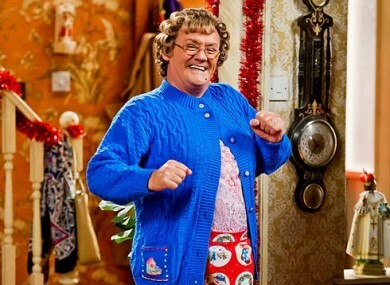 It’s a downturn on last year’s figures when 9.4 million sat down to watch Mrs Brown’s Boys on Christmas Day. Compared to last year, all peaktime BBC1/ITV programmes were down. #TheQueen bucked the trend - up by 90,000. The Strictly Come Dancing special was the fourth most watched programme in the UK yesterday, with 6.98 wannabee twinkletoes tuning in. An RTÉ spokesperson has told DailyEdge.ie that Christmas Eve viewership figures will be available on 29 December. Email “Mrs Brown's Boys beaten by the Queen to the top of the UK Christmas ratings”. Feedback on “Mrs Brown's Boys beaten by the Queen to the top of the UK Christmas ratings”.